I'm experiencing some steep learning curves right now. My mind is boggled to say the least. It's a little bit like picking up a new language. At that moment not a lot is making sense but I'm sure if I immerse myself that slowly it will all start to come together. I just cross my fingers each night hoping that the baby Orla sleeps more or less through the night! I need as much of my brain power as I can muster. As a result I'm making this short and sweet. Here are a few things that have caught my interest lately. This house tour belonging to Brady Cunningham. I want that macrame textile hanging over the fireplace. These stunning natural dyed Easter eggs. So much prettier than the garish store bought dyes. I'm totally giving this a try this weekend. Kristin's studio photographs of the two amazing women, Claudia Dey and Heidi Sopinka, behind the new Toronto based fashion label Horses Atelier. I want all of their dresses! 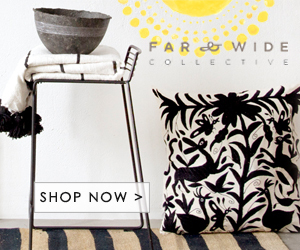 And finally a little interview with me on the West Elm blog!